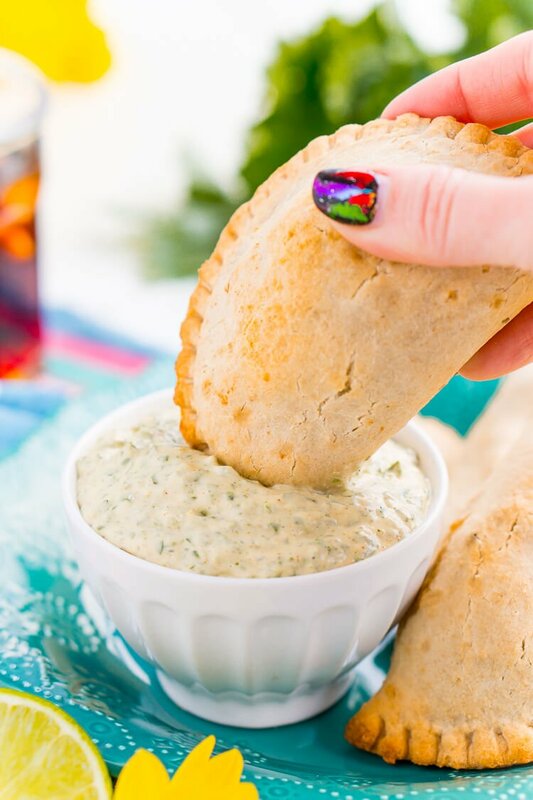 This Spicy Cilantro Lime Aioli is the perfect pairing for chicken empanadas, tortilla chips, and so much more. 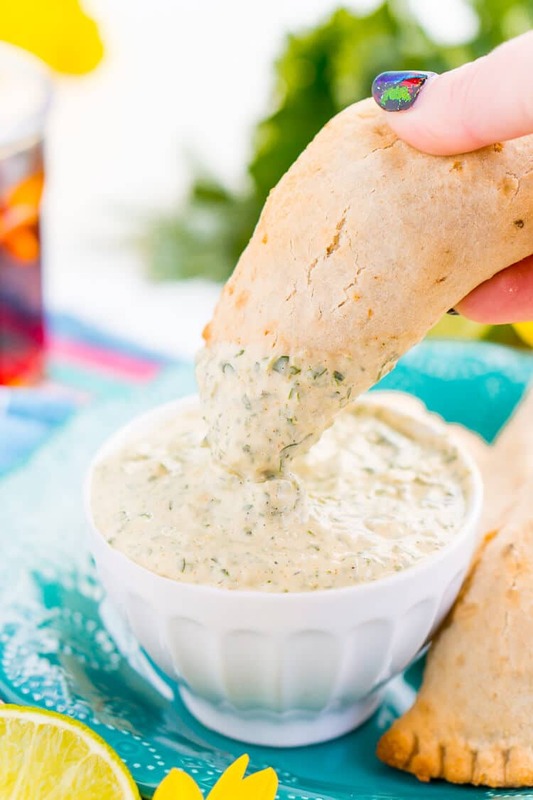 A blend of cilantro, jalapeños, lime, garlic, and spices make for an addictive dip! New Englanders know that once the ambiance of the holidays is over, winter can drag on for months on end. We’ve been known to get winter storms in March, April, even May, and when more snow falls than melts, it sometimes feels like we’re in Narnia and winter will never end! As we near the end of January, we’ve been getting some mild weather (well, “mild” by a Mainer’s standards), but we’ve still seen more clouds than sunshine. When I start to get the winter blues, I find that it helps to replicate a “summertime feeling” inside — specifically, in my kitchen! Everyone knows that warm foods are coziest when it’s cold, but when I’m dreaming about palm trees and sand between my toes, I like to make foods with exotic flavors and a little bit of spice. So when I received a coupon for Buen Sabor Empanadas at BJ’s, the thought of bold, Latin America-inspired flavors immediately piqued my interest. 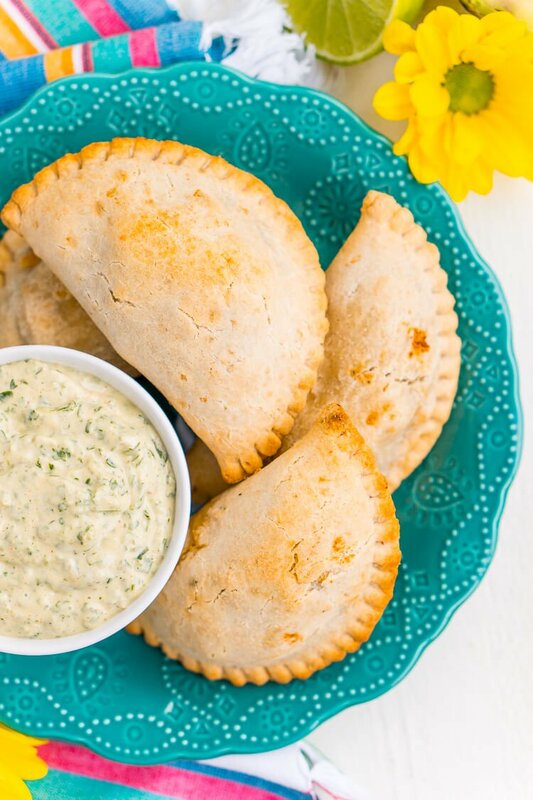 While I love anything that makes life easier, especially when it comes to meal prep, I’ll admit that I was hesitant about trying these frozen empanadas. I’m always worried about the chemicals and preservatives that usually come in packaged frozen foods, plus they usually taste terrible. But when I looked into Buen Sabor’s products, I couldn’t believe how natural and wholesome their frozen foods actually are! 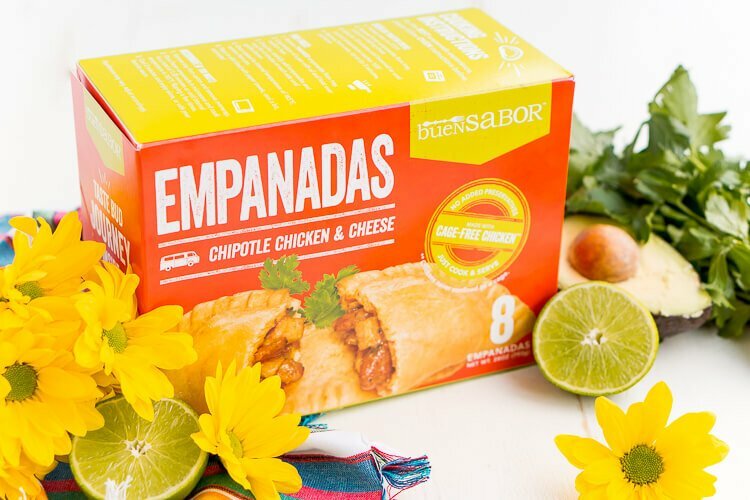 Buen Sabor’s “farm-to-shelf” mantra means that their products are made without preservatives, added colors or dyes, synthetic ingredients, artificial growth hormones or antibiotics, and they’re completely GMO-free. Even the chicken they use is cage-free. When I looked into the ingredients that they use in their empanadas, it was clear that they adhere to the slogan: “Junk free. Hype-Free. Ingredients you can pronounce.” Now, try to find another frozen food brand that can promise its consumers all that! I was sold on the quality and transparency of the ingredients, but one question remained: were these products actually tasty? As usual, I had to pick up a bunch of stuff at BJ’s anyway, so with my $1 OFF coupon in hand, I added the empanadas to my shopping list. I picked up a box of Buen Sabor’s newest variety, Chipotle Chicken & Cheese. They come in a pack of eight, so they’re great for quick and easy single-serve meals, or you can bake ‘em all and have a fiesta! I couldn’t wait to go home and pop a couple in the oven for a Spanish-inspired lunch. When I took my first bite of warm empanada, the flavors far surpassed any frozen meal I’ve ever tasted! The pastry dough was soft and flaky, the chicken moist and juicy. There was just enough melty cheese to fill every bite, but the best part was how the star ingredients were perfectly seasoned with the bold flavor of chipotle. 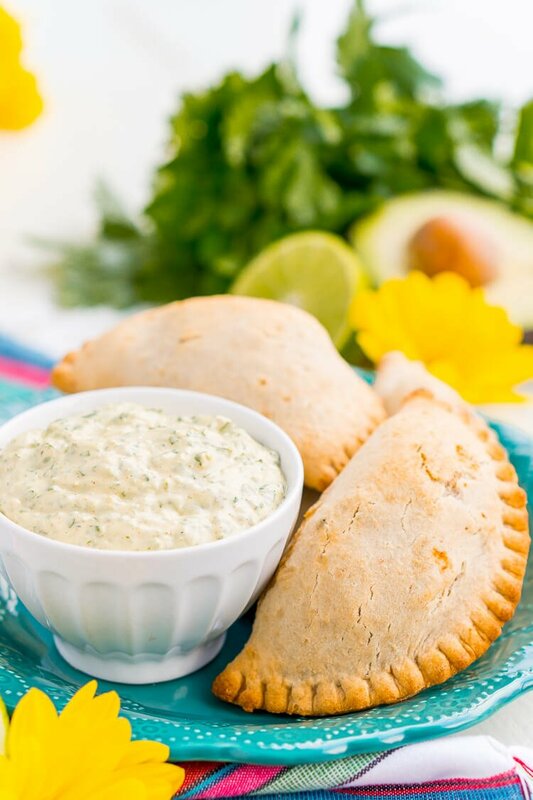 To take my new favorite “farm-to-shelf” food one step further, I decided to whip up a homemade aioli to dip to pair with my empanadas. The result? 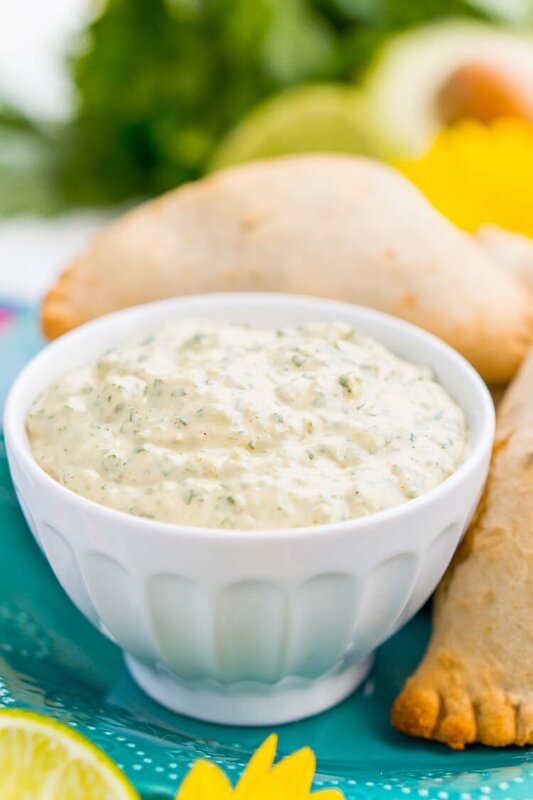 Spicy Cilantro Lime Aioli, a zesty sauce that adds some extra heat and cool tones to these yummy snacks. This mayo-based aioli is loaded with cilantro, lime, jalapeño, garlic, and spices for a tantalizing sauce that will awaken your taste buds! 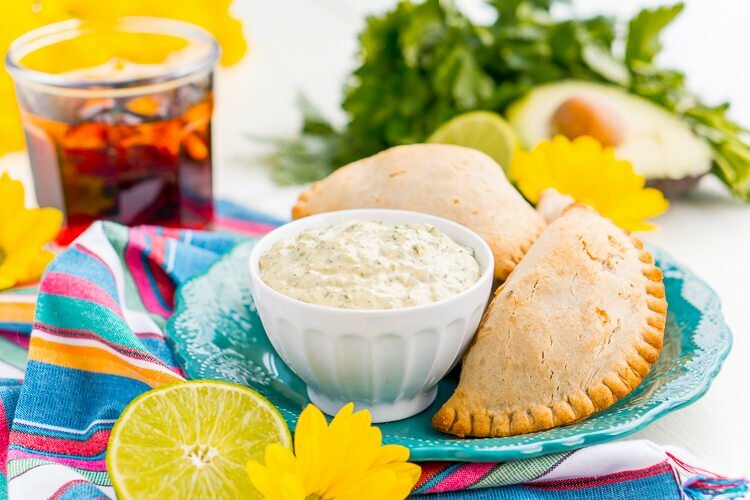 The savory empanadas dipped in Spicy Cilantro Lime Aioli taste like the hand-held delicacies offered by food trucks at fairs and festivals on warm summer evenings. Trying new, ethnic foods makes me feel adventurous, and with Buen Sabor Chipotle Chicken & Cheese. Empanadas, the adventure is right in my kitchen! Watch how to Make this Aioli in the video below! Cover and refrigerate for at least 2 hours before serving so flavors can blend. Regular mayonnaise may be used, but I prefer the olive oil blend. Miracle Whip should NOT be used as a substitute. Thank for this recipe. I loved the flavours. We dont have those empanadas in Australia but it works really well with fish. Our mayo isn’t as thick as in the USA so it was a bit thinner in consistancy, but as I mentioned I loved the flavours and next time will add more jalapeños and use a different style of mayo. Thanks again! I’m so glad you enjoyed it, Rebecca, it’s such a great dip/topping for a variety of dishes!